School starts soon and I cannot fathom how I will suddenly get used to getting dressed before 1 PM or doing any physical work in gym. The most I've done this summer is lifting this heavy container of magazine clippings I have. It's a terrible obsession, and whenever I flip through a magazine I know I'm not going to keep whole, I think that every photo could come in handy at some point, and as a result I have way more random photos than I could ever use. I have done a bit in this journal my sister made me, though, and thought I'd scan because they're just the tangible versions of Photoshop moodboards I was gonna make anyway. Also, I sound so dead and boring today because scanners hate me. Left: Dresses from National Geographic, Lara Stone in Vogue US. 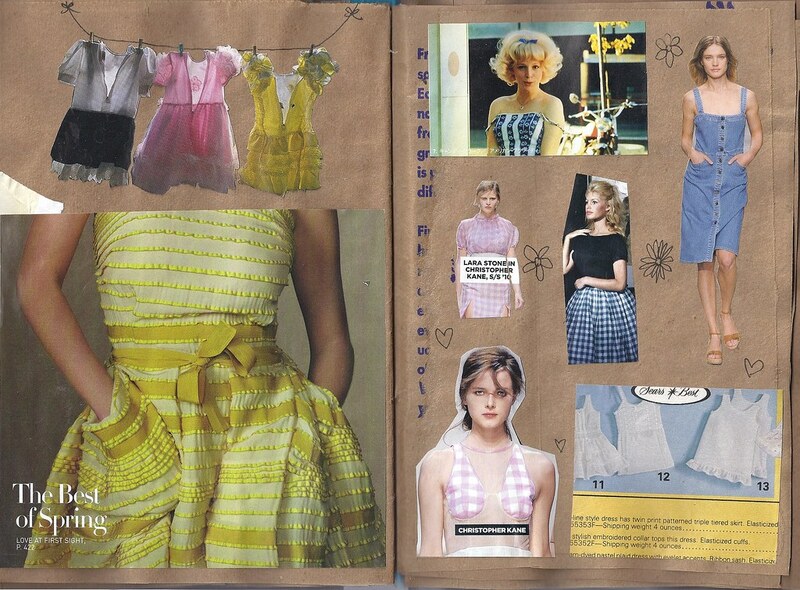 Right: American Graffiti, Stella McCartney SS10, Christopher Kane SS10, Brigitte Bardot, Kane again, and a snippet from a Sear's catalogue from the 80's. Mmmm, bugs. 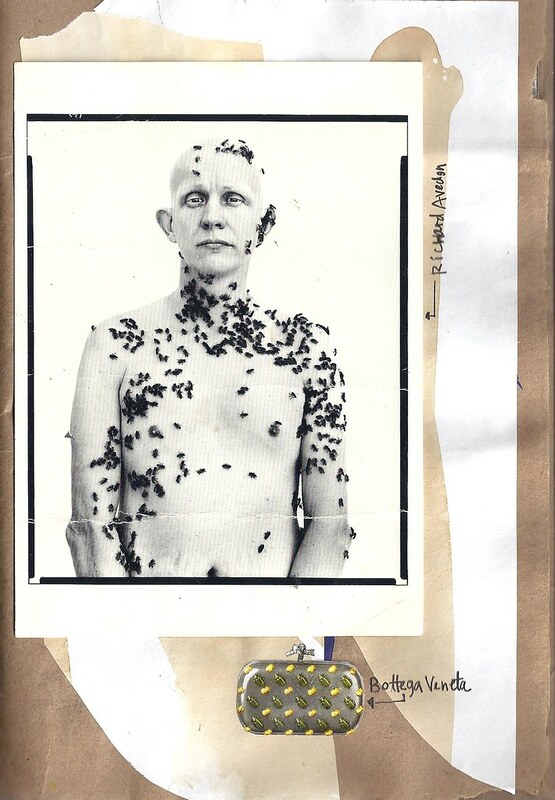 That man used to work at our local farmers' market and would hand out these postcards of him shot by Avedon. 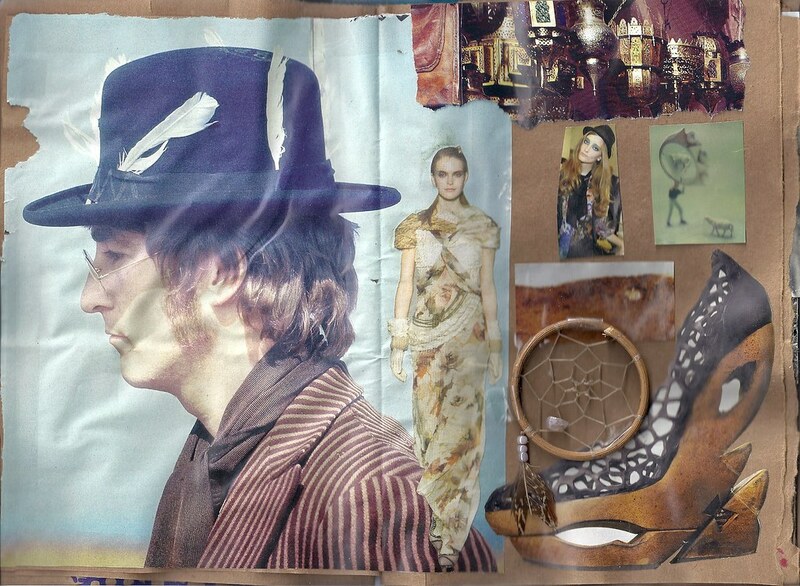 John Lennon, lanterns from a photo from Bazaar, Rodarte Fall 2010, Iekeliene Stange, dreamcatcher, and Jil Sander shoe. I don't remember where the seafoam ring and girl in the ground photos are from, so let me know if you know! Salvador Dali in Balenciaga Fall 2010. 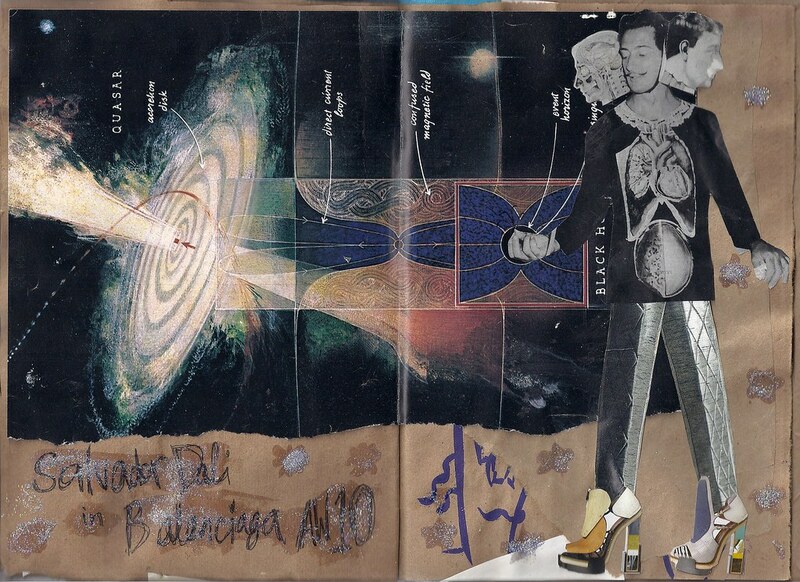 That astronomy photo is from a 70's issue of National Geographic, the Dali photo is from the Fall 2008 issue of T (have you seen the new issue? ISN'T IT SO GOOD?) and the pants and shoes are Balenciaga. The glitter is from a birthday party I went to at Club Libby Lu in 4th grade. You heard right. And no, I don't know why I still have it. THIS is how I want to dress this fall. Left: Grace Coddington and a kitty, Prada shoe/sock combo, Marc Jacobs Fall 2010, Miu Miu coat, Marc again, and Annie Hall. 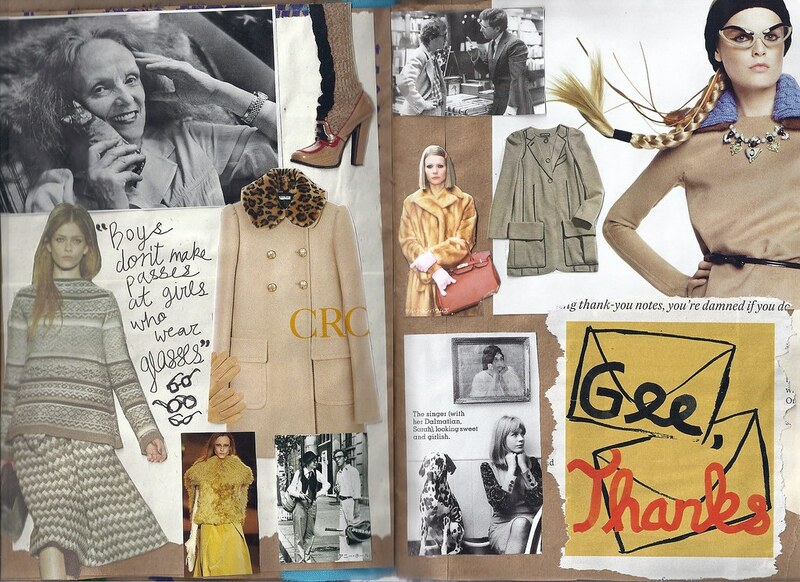 Right: Manhattan, Hanne Gaby Odiele in Prada in Vogue Nippon, Margot Tenenbaum, Sonia Rykiel jacket, young Marianne Faithfull, and something from the March 2010 issue of T.